The main characters are, of course, Romeo and Juliet. The story is 700 years after their time. After Romeo sacrificed Juliet’s life to have his own immortality, Juliet was also made immortal as well. For years, they have fought each other in the name of true love. Juliet was an interesting character to read. She spends her time not only trying to save true love, but to also make life better for the bodies she inhabits. However, while trying to do good things for these people, we see a deep, buried resentment in her. Resentment for what she has become, and also for what Romeo has done to her. I really liked her character, she was thoughtful and caring for others. I especially enjoyed her after she meets Ben, one of the soul mates she has come to help save. Romeo’s character was totally not what I was expecting. At the beginning of the book, he was just pure evil. It goes that way through much of the book. I didn’t think I would enjoy the book because of that, but it instead drew my attention even more, because I had to know what he was going to do. The Romeo we see in the last half of the book is completely different than what we saw in the beginning. Most of the secondary characters were pretty enjoyable as well. I found Ben to be very interesting and a bit mysterious at times. The character I didn’t care for at all would have to be Gemma. She was definitely the worst best friend, EVER. There were some slow parts in the book, but they quickly picked up not long after. There is also insta-love in the book, but I believe it was that way to resemble the Romeo and Juliet storyline, as they fell in love in just a few days time. So, I was pretty ok with it. Overall, I this was a book that I really liked. I’m definitely up for reading more books about Romeo and Juliet, should anyone else want to write one! Want to win a copy of Juliet Immortal?? Enter below! Ooh that sounds really good. I hadnt heard of it before. Thanks for the giveaway! Thanks so much for the wonderful giveaway! Juliet Immortal sounds amazing, I've been pining for it for a loooong time now! Great review Christy! I love the premise behind Juliet Immortal - I have a soft-spot for classic stories that have been adapted in new ways. Thank you so much for the giveaway! 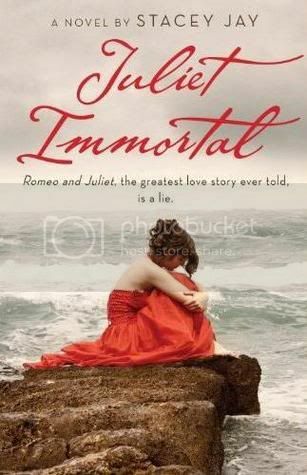 I've been dying to read Juliet Immortal! Sound different then what I might of expected. I really like when that happens. Great review! I hope to get it next week. Your review is great as always. I am interested to see what Romeo is all about. I've been waiting for your review of this and I'm so glad you liked it. I bought this yesterday, actually! Romeo being evil for some of the book!? Can't wait to see that! Great review! I just bought this book yesterday and cant wait to pick it up and read. Unfortunately I have a few others I HAVE to read to review first. Like you if its a Romeo and Juliet story..I'm into it! Thanks so much for the giveaway Christy, I've been dying to read this book! I love that we get a supernatural twist on the Romeo and Juliet story, and as much as insta love drives me crazy, I think it works in this case since the original happened that way as well. I've been wanting to read this for awhile, but haven't read any reviews about it until now. Glad you liked it! I'll have to add it to my list. Great review! I have been waiting for this one for like ever. AHHH I can't wait to read this! I LOVE LOVE LOVE LOVE LOVE Romeo & Juliet stories. They are probably my favorite types of love stories. I got this one from Amazon Vine but haven't read it yet. Think I'll have to move it up my TBR list! Good luck to everyone entering your lovely giveaway. This looks soo good! I saw it in the store the other day and almost bought it (along with about 15 other books that I want lol), but I'm saving up for a Nook, so I couldn't get anything. Great review! I'm so intrigued by this - I just love the unique twist on Romeo and Juliet. I'm glad you enjoyed it, I can't wait to read it! Awesome review! I am eager to read this book. Thanks for the contest. This is one I've been wanting to read and it sounds like it won't disappoint!